Diabetes is meer dan enkel maar verhoogde glucoseniveaus in het bloed. Het is evenmin een plots optredende ziekte, het is eerder de eindfase van een metabole ontsporing die al tientallen jaren aan de gang is. Het lichaam probeert zo lang mogelijk de verstoringen in de homeostase op te vangen door metabole aanpassingen, die echter wel hun prijs hebben op langere termijn. Het optreden van diabetes is het ogenblik waarop uiteindelijk de symptomen en gevolgen van deze ontsporing merkbaar worden. Sun JK, Keenan HA et al. Protection from retinopathy and other complications in patients with type 1 diabetes of extreme duration: the Joslin 50-year medalist study. Diabetes Care. 2011 Apr;34(4):968-74. Keenan et al. Residual insulin production and pancreatic ß-Cell turnover after 50 years of diabetes: Joslin Medalist Study. Diabetes 2010;59:2846-2853. Vinik A. The question is, my dear watson, why did the dog not bark? : the joslin 50-year medalist study. Pruimboom L. Insulineresistentie ‘Een pandemisch probleem’. AT&A 2011; 2:30-35. Meeusen J. Advanced glycation endproducts. Waarom suiker toxisch is. AT&A 2011; 2:38-43.
de M Bandeira S et al. Oxidative stress as an underlying contributor in the development of chronic complications in diabetes mellitus. Int J Mol Sci. 2013 Feb 5;14(2):3265-84. Dandona P et al. Macronutrient intake induces oxidative and inﬂammatory stress: potential relevance to atherosclerosis and insulin resistance. EMM 2010; 42(4):245. Folli F et al. The role of oxidative stress in the pathogenesis of type 2 diabetes mellitus micro- and macrovascular complications: avenues for a mechanistic-based therapeutic approach. Curr Diabetes Rev. 2011 Sep;7(5):313-24. Goodpaster BH. Mitochondrial deficiency is associated with insulin resistance. Diabetes. 2013 Apr;62(4):1032-5. Hernandez-Mijares A et al. Mitochondrial complex I impairment in leukocytes from type 2 diabetic patients. Free Radic Biol Med. 2011 May 15;50(10):1215-21. Supale S, Li N, Brun T, Maechler P. Mitochondrial dysfunction in pancreatic β cells. Trends Endocrinol Metab. 2012 Sep;23(9):477-87. Marchetti P et al. The beta-cell in human type 2 diabetes. Adv Exp Med Biol. 2010;654:501-14. Ahmed N, Thornalley PJ. Advanced glycation endproducts: what is their relevance to diabetic complications? Diabetes Obes Metab. 2007 May;9(3):233-45. Ansari NA, Rasheed Z. Non-enzymatic glycation of proteins: from diabetes to cancer. Biomed Khim. 2010 Mar—Apr;56(2):168-78. Edeas M, Attaf D, Mailfert AS, Nasu M, Joubet R. Maillard reaction, mitochondria and oxidative stress: potential role of antioxidants. Pathol Biol (Paris). 2010 Jun;58(3):220-5. Szabo C. Role of nitrosative stress in the pathogenesis of diabetic vascular dysfunction. Br J Pharmacol. 2009 Mar;156(5):713-27. 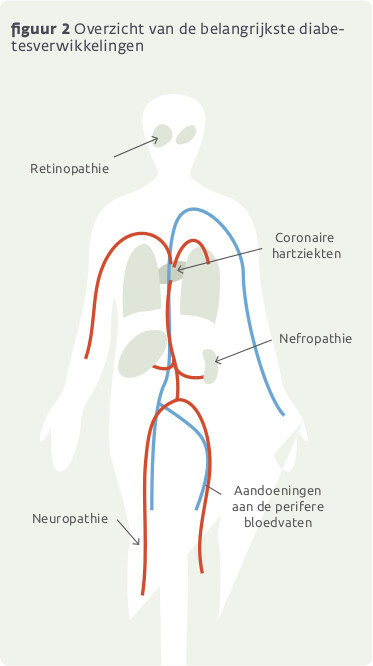 Nys M. Co-enzym Q10: diabetes, obesitas en andere pathologieën. AT&A 2011; 4:17-21. Cheng X, Siow RC, Mann GE. Impaired redox signaling and antioxidant gene expression in endothelial cells in diabetes: a role for mitochondria and the nuclear factor-E2-related factor 2-Kelch-like ECH-associated protein 1 defense pathway. Antioxid Redox Signal. 2011 Feb 1;14(3):469-87. Matheus AS et al. Impact of diabetes on cardiovascular disease: an update. Int J Hypertens. 2013:653789. Nakagawa T, Long DA et al. Abnormal Angiogenesis in Diabetic Nephropathy. Diabetes 2009; 58(7):1471-1478. Nooyens ACJ ‚Baan CA, Spijkerman AMW, Verschuren WMM. Type 2 Diabetes and Cognitive Decline in Middle-Aged Men and Women: The Doetinchem Cohort Study. Diabetes Care September 2010 3321964-1969. Gresele P et al. Hyperglycemia-Induced Platelet Activation in Type 2 Diabetes Is Resistant to Aspirin but Not to a Nitric Oxide-Donating Agent. 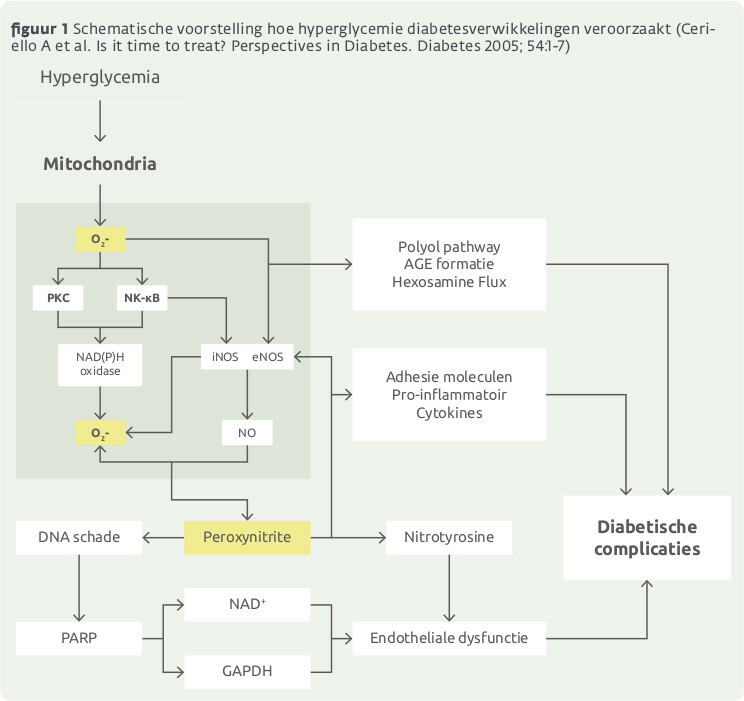 Diabetes Care J une 2010; 33(6): 1262-1268. Yu Y, Feng L, Shao Y, Tu P, Wu HP, Ding X, Xiao WH. Quality of life and emotional change for middle-aged and elderly patients with diabetic retinopathy. Int J Ophthalmol. 2013;6(1):71-4. Bentata Y, Haddiya I, Latrech H, Serraj K, Abouqal R. Progression of diabetic nephropathy, risk of end-stage renal disease and mortality in patients with type-1 diabetes. Saudi J Kidney Dis Transpl. 2013 Mar-Apr;24(2):392-402.
de Boer IH et al. Long-term renal outcomes of patients with type 1 diabetes mellitus and microalbuminuria: an analysis of the Diabetes Control and Complications Trial/Epidemiology of Diabetes Interventions and Complications cohort. Arch Intern Med. 2011 Mar 14;171(5):412-20. Ježek P, Dlasková A, Plecitá-Hlavatá L. Redox homeostasis in pancreatic β cells. Oxid Med Cell Longev. 2012;2012:932838.